brick home. Our only problem – there is no basement. No place for my “gun room” with all the bells and whistles. Where would I be able to work, clean and store my firearms? The logical choice seemed to be the car port that was enclosed by the previous owners. It’s made of brick and is referred to as the brick room. Pretty creative, right? I designed a layout of cabinets in the shape of an “L” to create the perfect storage and work area. We topped the cabinets with a functional as well as beautiful butcher block top. The room is open to the rest of the house so we didn’t want to bolt a gun vise or reloader to the surface. For several years I have been using table top gun work stations that move when any sort of pressure is applied. As you can imagine it just was not working. I needed something that did not move. 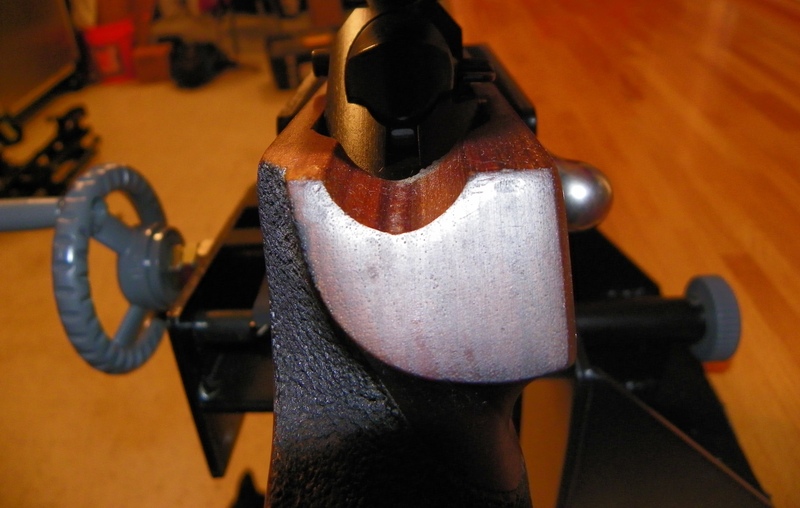 A good compromise was a vise that I could clamp down to hold my rifles and handguns for cleaning and gunsmithing. The plastic vises I tried were not strong enough to hold the firearm while removing a nut that was partially stuck or tightened. home is the portability. 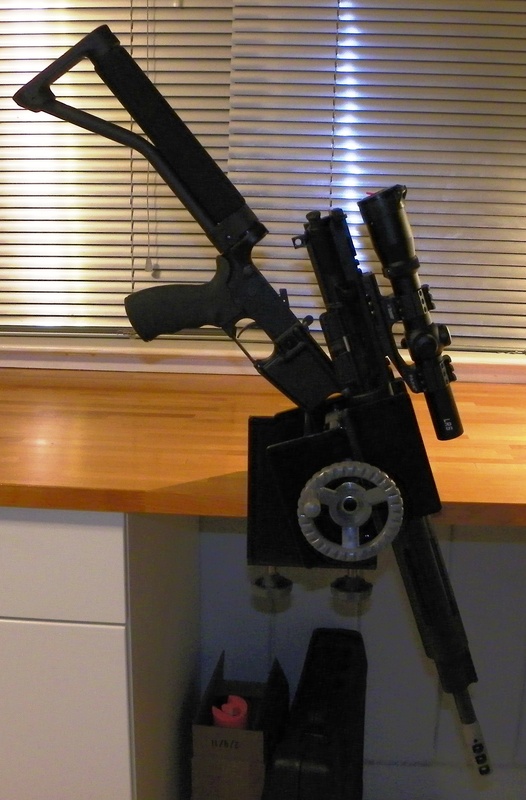 When I am not using the vise I can store it out of view or even take it with me to the range. The HYSKORE Portable Armorer’s vise makes working on your guns simple and easy. angle. With the upper angled downward all of the cleaning chemicals and debris run out the muzzle and not back into the action or trigger group. Even though HYSKORE designed the Portable Armorer’s Vise with the AR15 in mind, it can be easily adapted to all pump, semi-auto, bolt and lever action rifles and shotguns. For rifles and shotguns the barrel can be cleaned from the breech which is recommended by the manufacturers. I know it is hard to decide what will meet your needs in the form of a gun vise, but you won’t be disappointed with this option. There are countless ones on the market from the plastic to pricey bolt-downs but the features of this vise can’t be beat. With minimal effort you can lock a handgun or long gun in the vise with no damage to the stock finish. It will solidly secure the gun in foam padded jaws and rotates a fully 360° around a horizontal axis to permit efficient cleaning and servicing. Even if I had an option to permanently bolt down the vise I don’t think I would since the feature of being able to move locations or even take the vise to the range makes it perfect. both demo and tutorial videos. 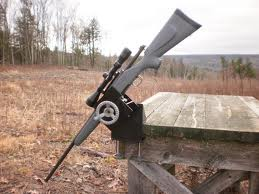 All of their advanced shooting accessories are affordable for the average shooter and are available at numerous retailers such as Cabelas, Midway USA, Cheaper than Dirt, the Sportsman’s Guide and BassPro Shops. To see even more photos of the HYSKORE check out Carducci Tactical’s Facebook page. 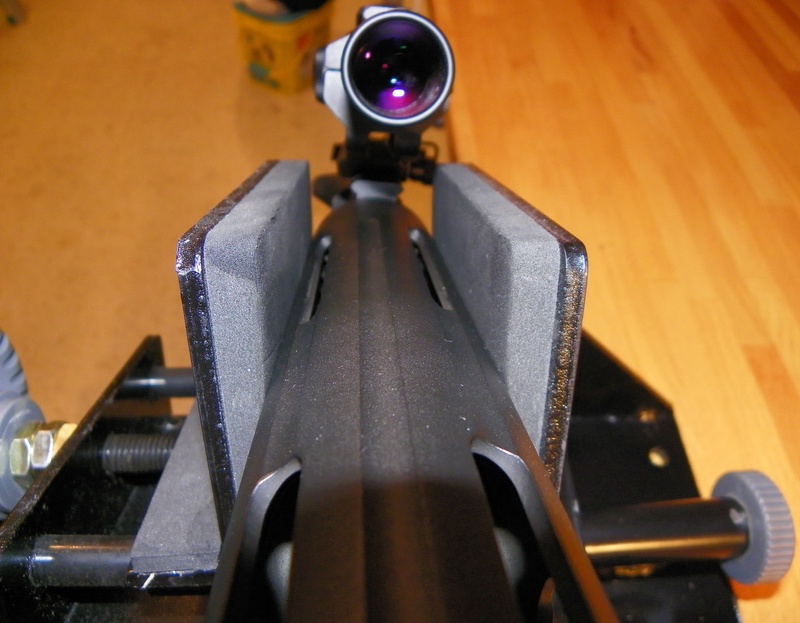 We also reviewed the HYSKORE Black Gun Machine Rest – another great product from HYSKORE. For questions email Danny at danny@carduccitactical.com or visit the HYSKORE website.